When specific events occur on a network, EventLog Analyzer can respond in several ways. EventLog Analyzer can generate alerts in real time—sending emails or SMS notifications to a designated receiver—or run custom scripts provided by an administrator. With multiple options available, users can be sure that no security events are missed. Customize the subject line and body of email alerts to include specific fields from the original log message that triggered the alert. Generate email alerts in HTML or plain text format. Include additional notes in the body of email alerts that may be useful to the person responding to the alert. Configure the alert mail server just by including the server name, port number, and sender email address. Use a secure TLS connection each time an email alert is sent out to provide added security if needed. Enable or disable email alerts at any time, and set a daily limit on the number of emails sent out. SMS alerts contain a short body of text with essential information about the log message that triggered the alert. 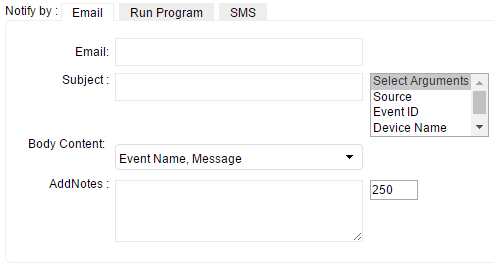 Choose which fields from the original log messages are included in SMS alerts. 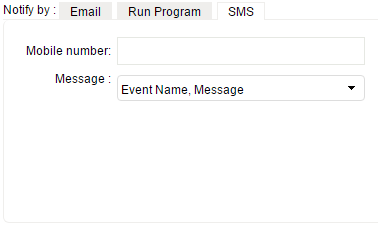 Simply enter the GSM communication port name to start generating text message alerts. Limit the number of SMS alerts sent per day. Designate custom scripts for specific events so scripts are triggered by EventLog Analyzer each time a specific alert condition arises. Forward log message fields to custom scripts as arguments. Writing specific information to a file. Publishing content to a social feed, such as an internal RSS feed.